A truly wonderful gaming headset. It’ll provide you with some of the best game audio available and provides exceptional bang for your buck. Creative is having a resurgence in gaming audio right now, and has swiftly become one of the best options when it comes to headsets. While there are literally 100s of gaming headsets to choose from in 2019, no matter what platform you play on, Creative is managing to stand out along with the likes of Razer, Turtle Beach, and Steelseries. Having not sampled a Creative audio product for a long while I was keen to see how the Sound BlastX H6 headset would stack up against the more established names. The H6 is a USB-connected (so will service your PC as well as your console if you’re so inclined) mid-range headset that comes in around $80/£70. This puts it in the very competitive mid-price category, where it’s tough to really stand out. But, from the off, it did. The headset’s design, as headsets and headphones go, is very pleasing on the eye; its black materials forming an understated unit with no outlandish features or colors to jar the aesthetic. It feels sturdy and has a good weight of around 330g to it, so feels solid enough to withstand accidents but not overly weighty to be uncomfortable. The headband is well cushioned and the high-density foam ear cups have a definite quality feel to them - this means they do a great job of noise cancelling without the need for specialist tech. And that foam makes the H6 exceptionally comfortable to wear, just really, super comfortable. Within the earcups are 50mm neodymium drivers which are fairly standard for gaming headsets, and perfect for presenting the bassy booms of action games. Back to the outside, the sleek black design is interrupted slightly by some cool-looking LED bands that can be customised through your PC - though, of course, you won’t be able to see these unless you are taking selfies or in a mirrored gaming room (please don’t do either of these things). The H6 has a detachable microphone and, combined with a good looking design, this means the transition between gaming headset and headphones for the commute is incredibly simple. The headband ratchet felt a bit loose at first but did stay secure enough when I was wearing the headset, which was the only slight problem with design. It’s a standard state of affairs inside the box: the headset is joined by a USB cable, an audio jack cable, the mic, and booklets covering warranty and set up. The combination of audio and USB cables means the headset will have you covered whatever your device; the jack for Xbox and mobile; the USB for PC, PS4 and Switch. The cables are even of a pleasant and appropriate length - the USB is 2m long - so should suit most gaming set-ups. There are a bunch of on-headset controls on the left cup which might look a bit baffling at first but you soon get used to them. There’s a volume dial, mic on/off button and ambient noise button bunched together on the back. At the front there’s an EQ profiles button that you can use to cycle through some of the pro-tuned game, movie and music pre-sets (or leave it all off). These are available whatever device you’re using and without having to install the companion software for the PC, so are useful features that will provide you with a different audio experience. Overall the buttons (powered by the USB connection) are serviceable quality and genuinely useful. The presets are fine, and a plethora of extra settings can be explored through Creative’s PC software. I was sceptical of the software at first as such features are often filled with fluff about changing your light display or registering for support and not actual sound profiles and mixing opportunities. However, Creative’s programme allows you to choose from lots of pre-made audio profiles, methods to indeed change your color schemes for your LEDs, and change and mix your audio setting as you see fit, through changes to your basic treble, middle and bass dials, but also to surround, crystallizer and dialog+ and many more. It was particularly useful going back to this software when changing between media and types of games, because it allows you to tailor your audio for different uses of the headset. Doom always gives any headset a good run for its money, particularly at the bottom end with its heavy basses and crunchy weapon noises, so that’s where I started when I finished examining and started testing the H6. The headset delivered all the noises of Doom seamlessly and clearly, even when the action got really bonkers. At the opposite end of the game audio spectrum sits Divinity Original Sin 2. This game’s soundtrack, dialogue and in-game noises are predominantly in the mid-to-upper regions; the medieval-esque music epitomising this. Here, the headset was equally good with sound coming through distinctly and, for the most part, very richly. The dialogue was lacking a bit of substance, which is a common failing of gaming headsets, but the overall mix was clear, and the music especially sounded lovely. In modern gaming headsets the surround sound has to be excellent. From single player titles to the plethora of battle royale shooters, you need to know exactly where people, shots and explosions are coming from. So, next I went to become a great hindrance to some of my friends in Apex Legends which allowed me to talk to them to test the mic, see how the overall audio performs in a fast-paced multiplayer experience and, crucially, test out that surround sound. My quick capsule review: it was bloody brilliant. The drop music came across clearly (more on that range later) and, in game, I felt perfectly served by the surround sound, and was able to hear all the audio cues, pings, movement and weapon noises. Very impressive. The mic equally was good as my friends could hear me clear as day, but perhaps not as richly as in more expensive sets. The H6 continued to impress when I turned to other media such as music, film, and TV. On my commute, audio books and music were both lovely and clear, with the earcups’ design helping to stop outside noise getting to me. It might have done slightly better with rock and metal but there was no noticeable drop in quality for any genre. Equally, it performed really well with TV and movies and would easily be capable of serving you well after you’ve put the games down or as a go-to set of headphones. The presets were relevant and useful across all the medias I tried and never struck me as superfluous gimmicks. Yes. A thousand times yes. The Creative Sound BlasterX H6 is one of my favorite gaming headsets and one of the best we’ve tested in its price range. It’s such a good performer that it would worry those headsets that come with a higher asking price, all due to its quality, versatility and overall value. 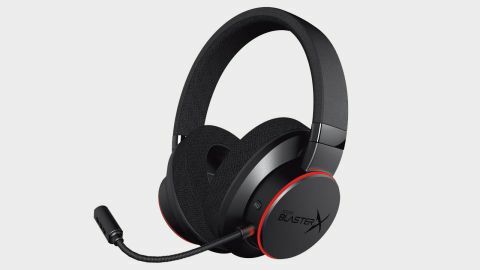 If you’re looking for a great gaming headset that excels with all other media, then the Creative Sound BlasterX H6 is a strong choice.